The pallet is made of edged lumber. Wood of natural moisture, arbitrary rock (spruce, pine, aspen, linden, birch), corresponding to the requirements of 2, 3 grades GOST 8486-86 or 2, 3 grades GOST 2695-83, is used. 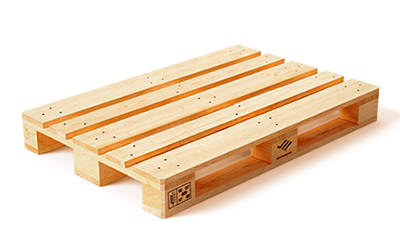 The pallet deck, having a thickness of 22 mm, consists of five boards alternating in order; wide (145 mm), narrow (100 mm), wide, narrow, wide. The distance between the boards does not exceed 4.5 cm, the length is 1200 mm, the length tolerances are -1 / + 2 mm. Three transverse boards measuring 22 x 145 x 800 with a tolerance of -1 / + 2 mm. he pallet stands on nine checkers; The extreme six measures 78 x 100 x 145 mm, the middle three 78 x 145 x 145 mm. Tolerances are -1 / + 2 mm. Lower boards have a thickness of 22 mm with a tolerance of -1 / + 2 mm. The width of the two extreme boards is 100 mm, the central board is 145 mm. On all three lower boards, there are facet chamfers facilitating the approach of the runners of the hydraulic trolley, and chamfers are made at the corners of the pallet. For the assembly of the pallet, screw nails or truncated nails (with a cross notch) of 3.5 x 70 nails (for attaching lower boards and checkers, 3 pieces per checker), 3.5 x 90 (for fixing the deck and checkers, 3 pcs. on the checker) and building nails 2,5 x 55 (for fixing the floorboards to the boards of carriers, 3 pieces per connection). «Frosta» is ready to consider proposals for the sale of wooden pallets, what are used. Our company offers a large number of points for receiving pallets in the Moscow region and other regions of Russia. You will rid your company of problems with the disposal of waste containers and garbage disposal. You will be able to аree up space in the warehouse. More than forty points of reception of pallets in all large cities of Russia. You use pallets to store products, but the prices for them do not suit You, do it? You can rent them from our company on favorable terms! We will promptly deliver the pallets to Moscow and the region, after which we will take them from you or from your customers. Reduce the company's expenses for the purchase of pallets in the case when there is no need for their regular use. Do not worry about repairing and replacing broken pallets. Avoid difficulties with the transportation of pallets and reduce the costs associated with it. Effective quality control system for leased containers and pallets. Timely replacement of damaged pallets and other packaging. Having trusted our company, You don't only save yourself from unnecessary expenses, but completely shift to our shoulders the responsibility for the serviceability of your pallets and their timely return from customers. © 2005-2017 Frosta LTD. All rights reserved.